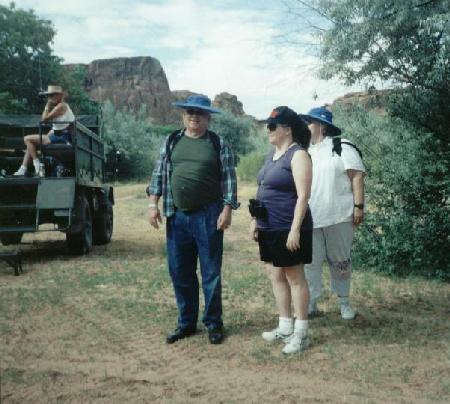 When we got there, after a long drive through west Texas and New Mexico, we pitched our tents in the campgrounds near the Canyon DeChelly Visitor Center. 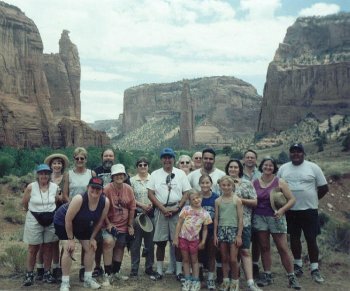 On the next day, we all met up at the nearby Holiday Inn to load up in the back of a vehicle called the UNIMOG for a tour of the Canyon. At various points throughout the Canyon, the UNIMOG would stop so that we could climb down and follow our guides in short walks to views of interest. 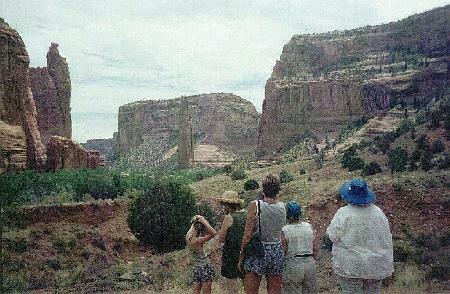 The views in Canyon deChelly are BIG. 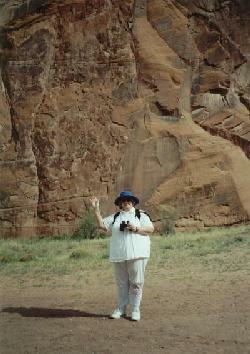 Here, Kay was particularly interested in the designs which adorned the canyon wall. Here was another stop we made further into the Canyon. One can see the UNIMOG much better (on the left) in this picture. We were grateful for the frequent stops because the vehicle provided a very bumpy ride. It was more exercise to keep oneself anchored in the back of that thing during it’s travels, than it was to get out and walk around. Even so, it was more fun than a barrell of monkeys! See those little bushes on the sloping part leading up to the Canyon walls? Oops! Those aren’t bushes – those are great big trees! And then Kay saw it. The pyramid that the Twelve Many Friends had told us to look for. It was near Spider Rock!